Following are excerpts from an article from Architecture and Design (3 July 2014). Engineered timber products like glued laminated timber (Glulam), laminated veneer lumber (LVL) and cross laminated timber (CLT) are gaining traction in many countries for multi-residential and commercial buildings. At the same time, further advances are being made with a variety of other timber innovations. Cross-banded LVL (LVL-C), whereby some LVL members are made with a few laminations laid up at right angles to enhance the strength of the member, is one such innovation. CLT panels with LVL outer layers, which give the product greater structural capacity with the same slab depth, are also available. Hollow-core CLT floor and wall systems are yet another example of new developments. Here, a hollow core takes the weight out of the panels whilst still allowing large spans. These types of systems are being developed into ‘sandwich panels’, where insulating materials are incorporated into the panels for external walls, roof sections and the like. Another ‘evolution’ is the rise of hybrid structures, which have entered into the mainstream building industry consciousness as an alternative to steel and concrete. Offering new construction advantages, hybrid timber-steel and timber-concrete systems have already been used to build many projects around the world. A recent Australian innovation is the hybrid LVL-steel I-Beam product, which is essentially a steel web with LVL flanges. This composite can include service penetrations throughout, and be used to create ‘cassette systems’. Floor cassette systems are made up of a number of parts. The first is the timber floor trusses, or the joists within the cassette, with truss webs to be made of either timber or a V-shaped metal web. On top of the floor cassette is the flooring system, which is typically a yellow tongue particleboard. 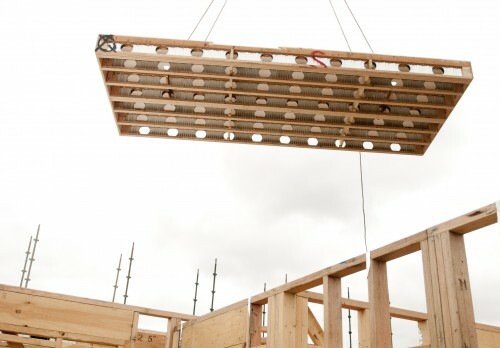 Insulation can also be prefabricated into the floor system, as can strongbacks or lengths of timber that run across the joist to give it additional stability. Tilling’s SmartFloor Cassette Systems is a product that boasts to be a fast and safe method of structural erection. Lighter than reinforced concrete so mobile cranes can be employed to install the cassette panels, SmartFloor offers flexibility in design with longer spans and the ability to use the panels for all floor assembly types simply by varying the panel thickness. As with Pryda, this system can be used to complement CLT. 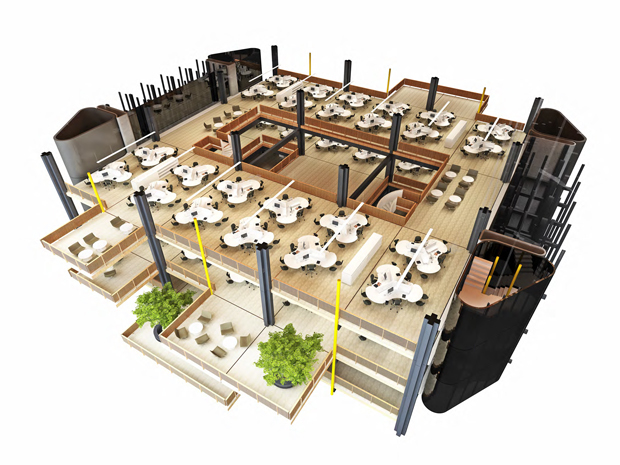 Fitzpatrick + Partners developed a timber cassette floor system for their Macquarie Park project which was significantly faster and cheaper to construct on site, lighter, environmentally sustainable, and easier to work with.